COAT McQ Alexander McQueen. SUNGLASSES Céline. SHIRT Acne (here). JEANS Frame Denim. BAG Kurt Geiger. BOOTS Jimmy Choo. Well, this is an outstanding denim outfit + that camel coat has upped the game of this whole look! Weather in NY is always so strange! Love your look! Your camel coat is beautiful! I also love your purse! Great elegant look! The coat is gorgeous and it looks great on you. Ususally I´m not such a huge fan of this color, but it looks really great with denim and black . Very classy ! You look amazing and I just love that coat. Your coat is so pretty! Love the outfit and obviously the coat is to die for. It also adds that extra to the all denim look. Oh AND i love those Jimmy Choo’s! Fantastic and super chic coat! love the rings and the coat is awesome!!! Carolina you are always so classy! Love it! Fantastic looking coat! It looks so cozy! Just stunning! Love the coat. Super stylish and lovely look! Beautiful coat! Weather here in Spain is similar to that, one day its good and other day is bad. this coat is absolute perfection! This coat is so perfect!! That camel colour just brings luxe to any outfit! That coat is beautiful. Looks gorgeous with the double denim look. This jacket is so luxe looking! And I love the way you styled it with the denim and black leather! Lovely! 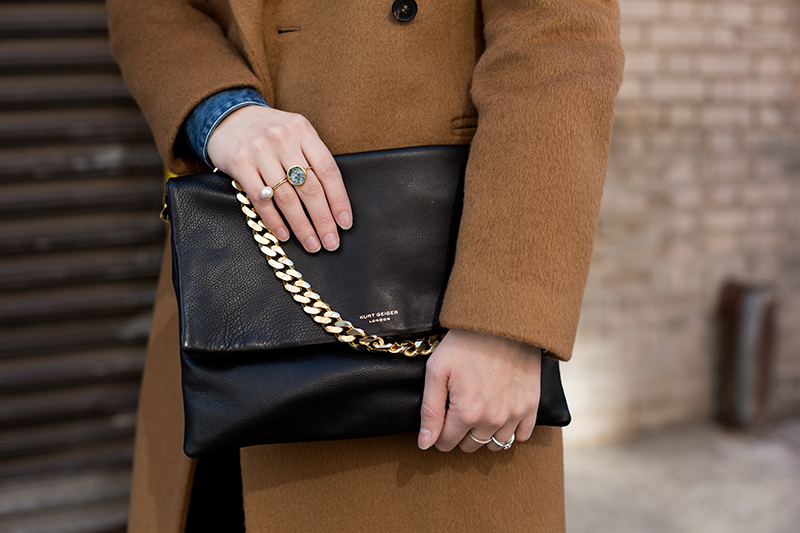 You never go wrong with a classic camel coat! Gorgeous look! Love your coat & bag! I like this camel coat, and it match the jeans is so cool. it’s so hard to find the perfect camel coat. love yours. Love the color and texture of the coat. I prefer it in a more contemporary fashion, though. Great outfit! I especially like the bag and the coat! Beautiful pictures! Check out my NEW Featured Photographer post! Your coat is amazingly chic! Your coat is truly stunning. I love your style!! So amazing!! Gorgeous gal, & Gorgeous Outfit.. So chic and classic. Such a beautiful classy look!!!! I love this colour with the gold from the KG bag!